We have a sump pump that is going off frequently with all the wetness in the ground. Concerned about long term viability. I have two sump pumps which helps but when there is a heavy rain water seeps in from the foundation in my basement. Have a french drain and 2 sump pumps already. Pumps run constantly and would like to understand what options might be available. Also, have a crawl space that gets some water during bad storms. Interested in options here as well. Thanks. We recently bought a new home (downsizing from prior one) and we have a crawlspace that the inspector recommended installing a vapor barrier in. He found the space to be dry and we have a de-humidifier running in there - hooked up to sump pump. We are looking to install vapor barrier. We need to reroute the water coming from our sump pumps. We have a large basement with some waterproofing needs. We would like to finish it into a nice laundry space, play area and storage space. I was very impressed with Walt Smith your Service Technician. He was not only a gentlemen, he was very knowledgeable about the system. He is a wonderful asset to your company and I hope he is recognized as a valued employee. Roberto and his team did an outstanding job and we are very pleased with the results. Connecticut Basement was the only company that called back. Whether you're looking to build a man cave, a room for the kids to play in, a wet bar, a home theater, or just want more storage space, finishing your basement can make your dream a reality. We work in basements all the time and know what's right to do in a basement space and what isn't. Our staff has the experience, technique and products to turn your dark basement into an additional part of your home living space. Don’t spend thousands of dollars on your basement project only to have to redo it after water damage! Choose from our beautiful, waterproof materials for a perfect basement that will last. Water can easily damage your home’s foundation, whether this be from flooding, moisture, or just excess water seeping through your foundation’s concrete over time. 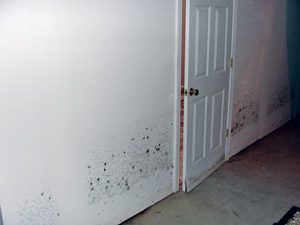 The real problem occurs when moisture comes in contact with organic materials like wood, plywood, carpet, tiles, fiberglass, and even products like “mold-resistant” drywall. Water in the basement means mold and rot will begin to grow on the drywall (in some cases where not visible) and will may need to be repaired, over even worse, re-gutted. But there is a solution! Why our basement finishing products are the solution! To prevent damage from flooding or excess water in your basement, we install a water drainage system before finishing your basement using waterproof and mold resistant materials. 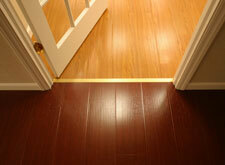 Our materials look just like wood and tile but are inorganic and resistant to mold. Our materials are also easily washable. You don’t need to search for studs in order to hang items on the wall, as our panels support up to 300 lbs! Each of the panels is built with an unbroken sheet of insulation inside and the floor panels have raised pegs keeping them off the concrete. This completely insulates your basement. For years, Connecticut Total Basement Finishing has been recognized as an industry leader in basement finishing and remodeling basements for White Plains residents. This recognition comes from our millions of satisfied customers throughout Connecticut who love their basements for as long as they own their home. We do the work we do because we not only want it to look great but to last as long as the house. 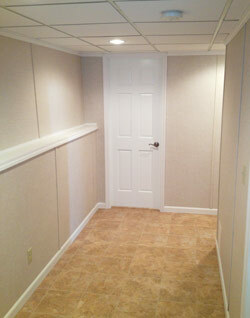 Don't wait any longer to make your basement beautiful, contact us today for a FREE quote! This is a great shot of the new door, Thermal Dry Flooring, and EverLast walls. All products compliment each other and are designed to be waterproofed. EverLast wall panels are strong and durable that resist mold or rot. This is a benefit because very little maintenance is required! The homeowners decided to get the full bathroom package. (any products not provided by us were purchased separately by homeowner) Looks beautiful! Experiencing water coming in from walls and through floors of unfinished basement. Need a new vapor barrier and insulation in crawl space. We are getting water in our basement (of our newly purchased home), and there's mold down there. Unfinished basement that we would like to turn into a multipurpose room with a bathroom. We found water in our basement and a wet rug and we think its coming from an outside source. My crawl space vents are open and need to be repaired. I am interested in improving the crawl spaces of my home.